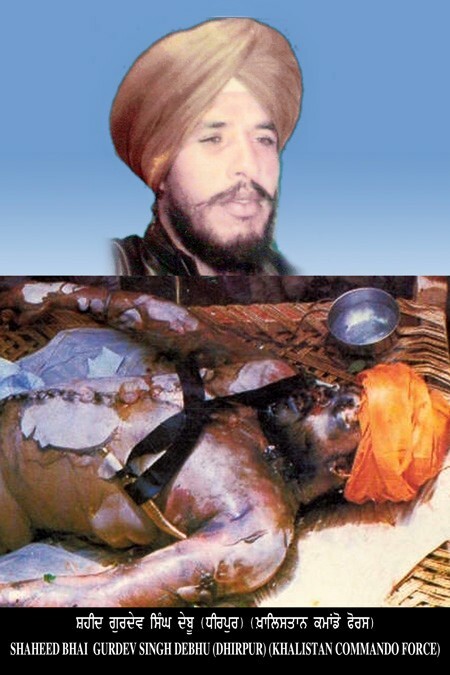 Gurdev Singh Debu (or “Area Commander Gurdev Singh Debu”) was a former president of area of Kartarpur of AISSF who joined the Khalistan Commando Force as an area commander under the leadership of Manbir Singh Chaheru after Operation Blue Star. After Guru Arjan Dev, countless Sikhs have given their lives but not given up their faith. Sikhs like Bhai Dayala jee followed Guru Arjan Dev jee’s example and were boiled alive. But for so many of us, even the thought of being boiled alive is too distant to understand. But it is a fact that many Gursikhs in recent years have been tortured in this brutal way but taking their inspiration from Guru Arjan, did not give up their cause. One such Gursikh is Shahid Bhai Gurdev Singh Debu. Bhai Gurdev Singh Debu was born on July 15, 1961 in village Dheerpur, Jallandhar. His parents were Mata Gian Kaur and father Sd. Gurbachan Singh Sekhon. Bhai Gurbachan Singh was a farmer. Bhai Gurdev Singh completed his primary education in Dheerpur and attended high school in nearby Dialpur. After this, Bhai Sahib began to work on motors and became known as an expert. In 1978, the Narakdhari cult with the connivance of the Government began to attack the Sikh faith and shot dead 13 Gursikhs in Amritsar on the day of Vaisakhi. The perpetrators were never brought to justice and were in fact protected by the Government. Bhai Gurdev Singh was deeply hurt by what had happened and after this began to remain very sad. He would talk to his friends about how much of an injustice had happened and expressed his desire to seek revenge on the enemies of the Panth. Bhai Sahib’s parents were alarmed at this change in nature and thought that perhaps marriage would help settle him down. Bhai Gurdev Singh was married to Bibi Balvinder Kaur and they would have one daughter and one son together. However, Bhai Sahib’s pain at the state of the Panth did not lessen. Along with the local Sangat, Bhai Gurdev Singh went to Sri Darbar Sahib and heard the lectures of Sant Jarnail Singh Khalsa Bhindravale. He was so impressed that he decided to remain there with Sant jee to serve in the Dharam Yudh Morcha. After some time, Bhai Gurdev Singh became very close to Bhai Amrik Singh and Sant Jarnail Singh Khalsa. From December 26 to 31, 1983, Bhai Gurdev Singh participated in a camp organized by Sant Jarnail Singh and Bhai Amrik Singh, where Gurbani, Sikh history and philosophy were taught. The goal of the camp was to create Sikh preachers who could transform the Punjab countryside. He was given a certificate at the end of the course. Bhai Sahib used this knowledge to travel to schools and colleges to establish units of the All India Sikh Student Federation. On March 2, 1984, in a conference organized by the AISSF, Damdami Taksal and others, Bhai Gurdev Singh was made the president of the Kartarpur area. After this, the police made Bhai Gurdev Singh and his family one of their main targets. His parents along with his brothers were arrested and tortured and later even his sister and wife were taken away. But Bhai Sahib did not return home after that and refused to leave his seva. Bhai Gurdev Singh travelled from village to village organizing Gurmat conferences and amrit sinchaars. Sant Jarnail Singh also gave Bhai Gurdev Singh the seva of doing saskaar of old beeRs of Sree Guru Granth Sahib at Goindval Sahib. Bhai Sahib was busy doing this seva when the Government of India attacked Sree Harmander Sahib Amritsar and slaughtered countless men, women and children. The attack on Sree Amritsar was unbearable for Bhai Gurdev Singh. He gathered together with his few remaining companions and decided to show the government that not all the Singhs had been finished. They burnt down government rail stations and became a persistent nuisance for the Security Forces. The police began to hound Bhai Gurdev Singh and he decided it would be best to travel to Pakistan for training and some quiet time. When Bhai Sahib returned to India, the government broadcast his picture along with the pictures of the other Singhs on television advising citizens to be on the look out. Bhai Sahib remained in Chardi Kala and did not care who could recognise him. Bhai Sahib joined with Bhai Manbir Singh Chaheru, Bhai Mathra Singh, Bhai Tarsem Singh KuhaaR and others to form the original Khalistan Commando Force. Bhai Gurdev Singh became the Area Commander for Doaba and participated in many actions. He was respected not only by the Singhs in the KCF, but by all Jathebandis. The police began to dread the very name of Bhai Gurdev Singh. Bhai Sahib took part in many battles with the police and always inflicted heavy damage. He was terror incarnate for the Indian Government. Soon if the police knew Bhai Gurdev Singh was in a certain area, they would evacuate and leave so that they would not run into him. Under the command of Bhai Gurdev Singh, Doaba did not see any looters commit crimes. They were too terrified to act. The Hindus of the area also loved Bhai Gurdev Singh since he would help poor Hindu families by giving money and not let anyone harass them. Even today, the Hindus remember Bhai Sahib and attend his yearly Shahidi Memorial. Bhai Gurdev Singh built links with many prominent Singhs like Bhai Harjinder Singh Jinda, Bhai Satbachan Singh Sakruli, etc. and worked on punishing the police touts, Narakdharis, and informers. The police made many tries to capture Bhai Sahib but each time were unsuccessful. But they say that when one patriot is born, thousands of traitors are born with him. One person who brought himself close to Bhai Gurdev Singh and presented himself to be a great Sikh sympathiser, invited Bhai Sahib to his home and put a powder in the milk he served. Bhai Gurdev Singh fell unconscious and was arrested in this state. Bhai Sahib was considered one of the top Singhs in Movement and the police were ecstatic at having made this catch. They had captured a sleeping lion. Bhai Sahib was questioned about his fellow Singhs and where he had hidden the weapons of the Commando Force. Bhai Sahib refused to speak a word. It was the hot month of July and Bhai Sahib was kept in a small cell with no food or water. Like all Sikh fighters, Bhai Gurdev Singh was first beaten but he did not say a word. His bones were broken and twisted. Next, his legs were cut open and hot chillis were thrust in, but again, he gave no information. Bhai Gurdev Sigh’s body was then pierced by red hot iron rods but the reaction was still silence. The frustrated police then went so far as to cut out Bhai Sahib’s eye. Not one hideout was revealed and Bhai Gurdev Singh was lost in Gurbani. Like his master and role model, Satguru Arjan Dev, he kept repeating ‘ਤੇਰਾ ਕੀਆ ਮੀਠਾ ਲਾਗੈ ॥ਹਰਿ ਨਾਮੁ ਪਦਾਰਥੁ ਨਾਨਕੁ ਮਾਂਗੈ॥’. The police reached the limit of brutality when they could not get any information. They boiled a tub of water and put Bhai Gurdev Singh in. The scene of Bhai Dayala in the boiling cauldron was repeated again and this Singh too did not falter. Bhai Gurdev Singh refused to speak a word and seeing his final moments before him, only cared about Gurbani. Bhai Gurdev Singh was boiled to death but did not reveal a single companion’s name, hideout or weapons cache. On Friday July 3, 1987, the police attempted to show a fake encounter and claim Bhai Sahib had been killed in a gunbattle. News spread like jungle fire and the entire area was stricken with grief. Local villagers surrounded the police station with their tractors, trolleys and buses and demanded they be given the body of their hero to cremate with full honours. The police were terrified of what the mob might do, so they handed over Bhai Gurdev Singh’s mutilated body. The villagers saw the remains of Bhai Gurdev Singh and even hearts of stone melted. The unspeakable torture he faced was clear to all. All wondered how any human could possibly do this to another? News of this brutal death spread across Punjab. Thousands of Sangat arrived for Bhai Sahibs Bhog. The police had sealed the area to prevent a large gathering, but the Sangat broke through all barriers to honour their Shahid. Bhai Sahib had shown that Khalsa Spirit is alive today and Sikhs can still bear the same tortures and not lose their faith. This was not the end for Bhai Gurdev Singh’s family. The police had been unable to take even a single piece of information from Bhai Sahib and his Shahidi had inspired thousands of Sikh youth. The Indian Security Forces were shocked at the horror they could inflict and still not be successful and were humiliated by the public reaction. Bhai Sahib’s family including Bhai Gurdev Singh’s mother, father, brothers, sister and wife were arrested and tortured. They wanted to know where Bhai Sahib had hidden his weapons. Bhai Sahib’s mother and brothers were hung from the roof to get information but spoke nothing. With so much blood filling the foundations of Khalsa Raj, is there any doubt that it will be a reality? What will we do to bring this reality about? In the month of June 1987, he was boiled to death by Punjab Police.